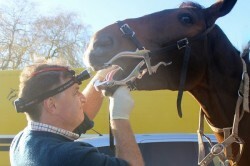 Looking after your horse’s dental health is a very important part of equine management and easily overlooked. Dental problems can cause significant mouth pain, weight loss and problems being ridden. 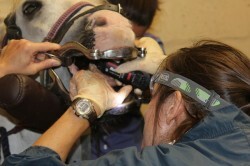 We recommend all horses’ teeth should be routinely examined every six months. Annual vaccination is a good time for us to check your horse’s teeth and rasp them if necessary thus allowing prevention of many dental problems, or at least to identify any potential problems prior to them causing too much discomfort. 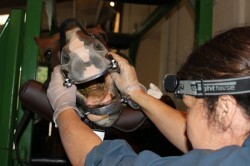 We are happy to have dental clinics at yards and examine multiple horses during one visit. 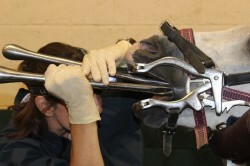 Regular dental care is important for all equines to ensure sharp edges and hooks are reduced to prevent ulceration of the mouth and difficulty chewing. Further abnormalities such as over/under bite, diastema and fractured crowns can also be identified. Horses have a very high fibre diet and it is important that they can chew effectively in order to break down the fibre before it enters their digestive system. Insufficiently chewed food is wasteful and expensive, and can lead to ill-thrift or more seriously colic or choke. All our vets are very experienced dental practitioners and have attended courses on dentistry. Some of our team have particular interests in dentistry. 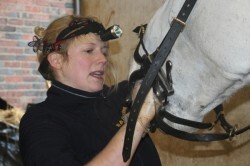 Anna Etherton is endeavouring to progress veterinary dentistry within the practice and has attended BAEDT and BEVA courses in dentistry, she will be sitting further examinations in 2019. All veterinary surgeons within the practice have the experience, access to pharmaceuticals and equipment to provide all dental work, both routine and more extensive, including power tool work and extractions, and imaging such as x-rays if necessary. Please remember it is illegal for anyone other than a Veterinary Surgeon to dispense, supply or stock prescription only medications; therefore they are the only professionals able to administer sedation to your horse for any more invasive dental treatment. It is also illegal for anyone other than a veterinary surgeon to remove teeth unless they are palpably loose. As a practice we are routinely asked to sedate for ‘the dentist’, as part of the booking procedure our reception staff will ask the name of your Equine Dental Technician (EDT). It is important that you are fully aware of the qualifications of your dentist, are they registered with an organisation such as BAEDT? It is also important to note that many insurance policies will now refuse claims for dental treatment unless routine dental care is carried out by a veterinary surgeon or approved EDT.